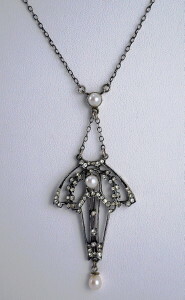 1910's vintage ART NOUVEAU lavalier style necklace. Patinated sterling silver, paste and pearls. Open work art nouveau design lavalier drop. Three pearl embellishments. Top pearl with two chain extension. Single pearl drop bottom. Spring ring clasp closure. Tests: sterling. All original, true 1910's era vintage, NOT a modern remake. In 1996 we were privileged to provide rental wardrobe to the Fox/Paramount production of James Cameron's TITANIC. It is without a doubt, one of the most exciting projects we have ever been associated with. This necklace was selected personally by the costume designer as a significant accessory piece and intended to be used on camera in foreground or for principal. This is the first time it is being offered for public consideration. Included with the purchase is a copy of the original Titanic rental inventory page listing the item & photo copy authentication between the production and Repeat Performance, documenting specifically item RP#90-99JLN, the identifiable inventory number of the necklace. Center piece drop length - 2 3/4" X 1 1/4"
EXCELLENT condition. Unpolished, original lightly patinated finish.